On approved credit through NMAC. Two at this price. VIN: 1N4BL4BV5KN305313, 1N4BL4BV5KC160091. 36-month lease + tax title license. Total due at signing excludes taxes, title, license, fees, DMV, doc fee of $85, acquisition fee of $650 and first payment. $2,995 consumer down payment, $198 first month payment. Available to well-qualified lessees through Nissan Motor Acceptance Corporation. Selling price: $25,979. 12,000 miles per year. Excludes tax, DMV first payment, and fees. A disposition fee is due at termination of lease term. Illustration shown may not be the same as actual vehicle sold. On approved credit through NMAC. Two at this price. 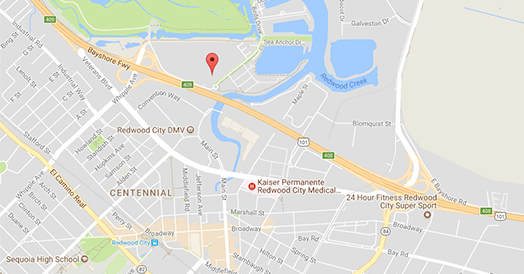 VIN: 1N4AZ1CP1KC305944, 1N4AZ1CP0KC307880. 36-month lease + tax title license. Total due at signing excludes taxes, title, license, fees, DMV, doc fee of $85, acquisition fee of $650 and first payment. $3,995 consumer down payment, $139 first month payment. Available to well-qualified lessees through Nissan Motor Acceptance Corporation. Selling price: $33,125. 10,000 miles per year. Must be loyalty and VPP. No Loyalty add $58 to payment. No VPP add $377 to payment. Excludes tax, DMV first payment, and fees. A disposition fee is due at termination of lease term. Illustration shown may not be the same as actual vehicle sold. On approved credit through NMAC. Two at this price. VIN: 3N1AB7AP1KY208872, 3N1AB7AP9KY221031. Advertised prices exclude taxes, any Finance charges, any dealer document processing charge, any electric filing charge, and any emission testing charge. Must finance with NMAC at standard rates. Not compatible with special financing. MSRP $18,010. 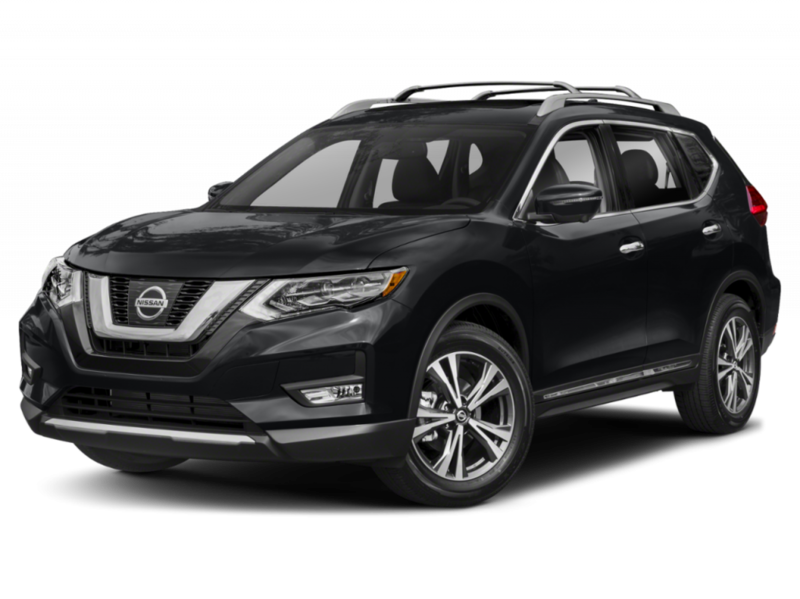 Available to well-qualified buyers through Nissan Motor Acceptance Corporation. See dealer for details. Illustration shown may not be the same as actual vehicle sold. On approved credit through NMAC. Two at this price. VIN: JN8AT2MT5KW250818, JN8AT2MT4KW252009. 36-month lease + tax title license. Total due at signing excludes taxes, title, license, fees, DMV, doc fee of $85, acquisition fee of $650 and first payment. $2,600 consumer down payment, $229 first month payment. Available to well-qualified lessees through Nissan Motor Acceptance Corporation. Selling price: $27,455. 12,000 miles per year. Excludes tax, DMV first payment, and fees. A disposition fee is due at termination of lease term. Illustration shown may not be the same as actual vehicle sold. On approved credit through NMAC. One at this price. VIN: 1N6AA1EK7KN514724. Advertised prices exclude taxes, any Finance charges, any dealer document processing charge, any electric filing charge, and any emission testing charge. Must finance with NMAC at standard rates. Not compatible with special financing. MSRP $41,370. 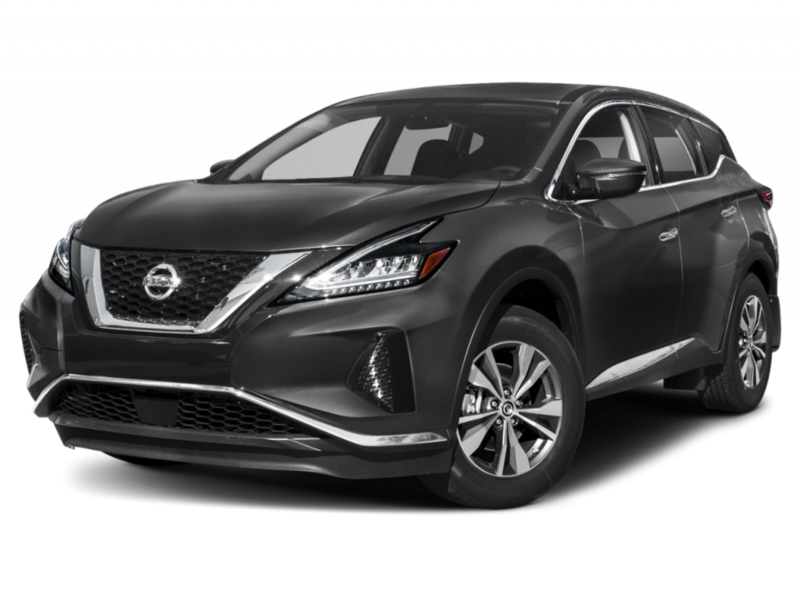 Available to well-qualified buyers through Nissan Motor Acceptance Corporation. See dealer for details. Illustration shown may not be the same as actual vehicle sold. On approved credit through NMAC. Two at this price. VIN: 5N1AT2MT8KC737780, 5N1AT2MT4KC737842. 36-month lease + tax title license. Total due at signing excludes taxes, title, license, fees, DMV, doc fee of $85, acquisition fee of $650 and first payment. $2,600 consumer down payment, $298 first month payment. 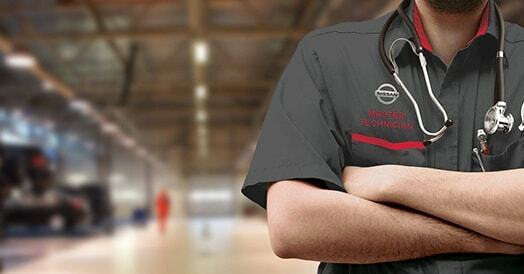 Available to well-qualified lessees through Nissan Motor Acceptance Corporation. Selling price: $35,065. 12,000 miles per year. Excludes tax, DMV first payment, and fees. A disposition fee is due at termination of lease term. Illustration shown may not be the same as actual vehicle sold. On approved credit through NMAC. One at this price. VIN: 1N4BL4CV7KC124207. Advertised prices exclude taxes, any Finance charges, any dealer document processing charge, any electric filing charge, and any emission testing charge. Must finance with NMAC at standard rates. Not compatible with special financing. MSRP $27,915. 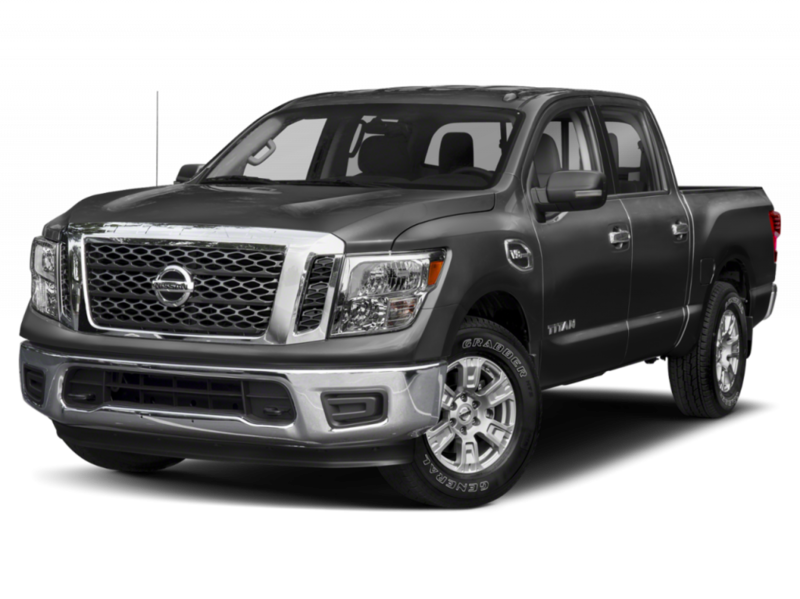 Available to well-qualified buyers through Nissan Motor Acceptance Corporation. See dealer for details. Illustration shown may not be the same as actual vehicle sold. On approved credit through NMAC. Two at this price. VIN: JN8AT2MT5KW250818, JN8AT2MT4KW252009. Advertised prices exclude taxes, any Finance charges, any dealer document processing charge, any electric filing charge, and any emission testing charge. Must finance with NMAC at standard rates. Not compatible with special financing. MSRP $27,455. 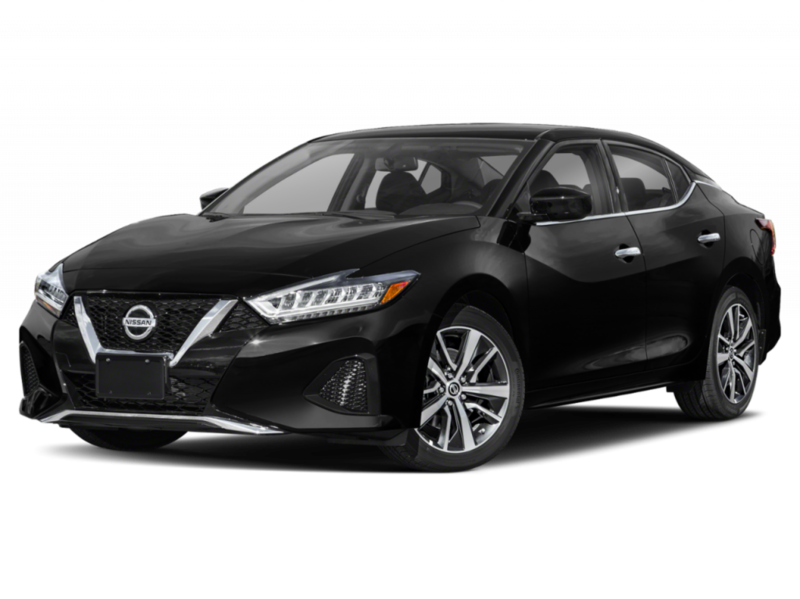 Available to well-qualified buyers through Nissan Motor Acceptance Corporation. See dealer for details. Illustration shown may not be the same as actual vehicle sold. On approved credit through NMAC. Three at this price. VIN: 1N4AZ1CP3KC307999, 1N4AZ1CP3KC307548, 1N4AZ1CP4KC305808. 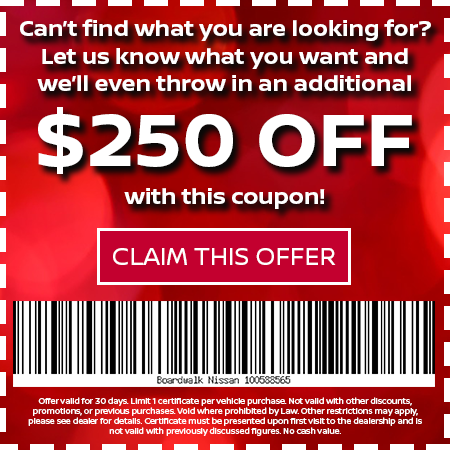 24-month lease + tax title license. Total due at signing excludes taxes, title, license, fees, DMV, doc fee of $85, acquisition fee of $650 and first payment. $3,995 consumer down payment, $89 first month payment. Available to well-qualified lessees through Nissan Motor Acceptance Corporation. Selling price: $33,275. 12,000 miles per year. Must be loyalty and VPP. No Loyalty add $58 to payment. No VPP add $377 to payment. Excludes tax, DMV first payment, and fees. A disposition fee is due at termination of lease term. Illustration shown may not be the same as actual vehicle sold. On approved credit through NMAC. One at this price. VIN: 1N4AA6AVXKC367025. Advertised prices exclude taxes, any Finance charges, any dealer document processing charge, any electric filing charge, and any emission testing charge. Must finance with NMAC at standard rates. Not compatible with special financing. MSRP $37,930. 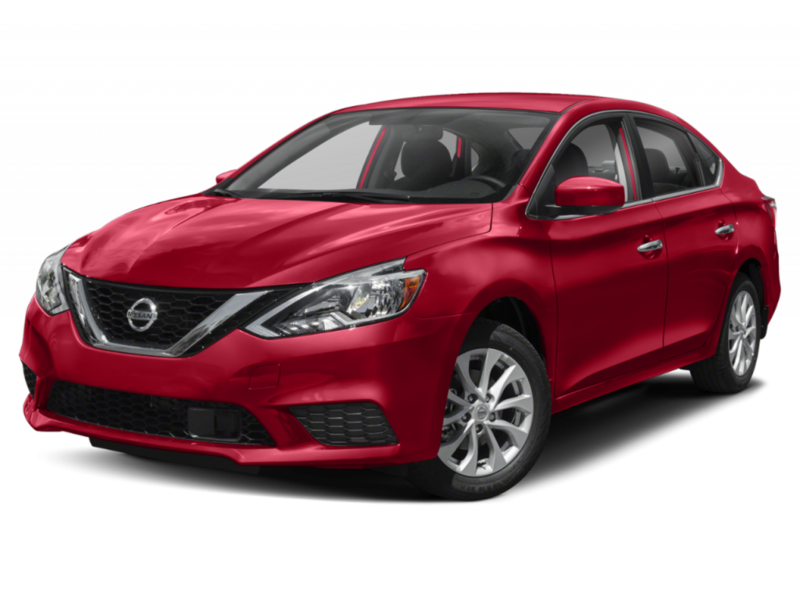 Available to well-qualified buyers through Nissan Motor Acceptance Corporation. See dealer for details. Illustration shown may not be the same as actual vehicle sold. On approved credit through NMAC. One at this price. VIN: 5N1AZ2MJ4KN101858. Advertised prices exclude taxes, any Finance charges, any dealer document processing charge, any electric filing charge, and any emission testing charge. Must finance with NMAC at standard rates. Not compatible with special financing. MSRP $46,195. 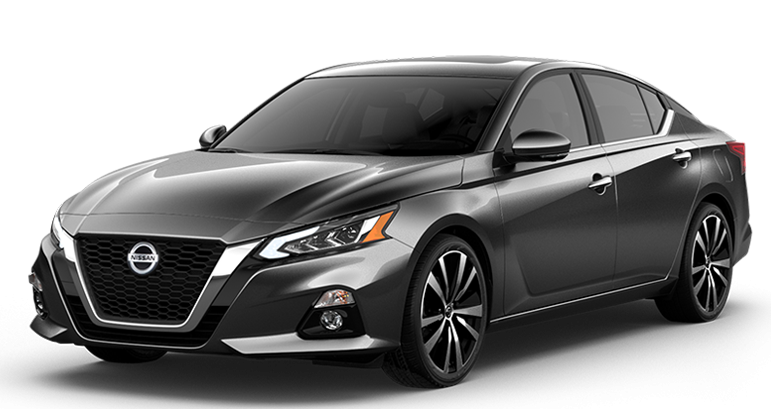 Available to well-qualified buyers through Nissan Motor Acceptance Corporation. See dealer for details. Illustration shown may not be the same as actual vehicle sold. On approved credit through NMAC. Two at this price. VIN: 5N1AT2MT8KC737780, 5N1AT2MT4KC737842. Advertised prices exclude taxes, any Finance charges, any dealer document processing charge, any electric filing charge, and any emission testing charge. Must finance with NMAC at standard rates. Not compatible with special financing. MSRP $35,065. 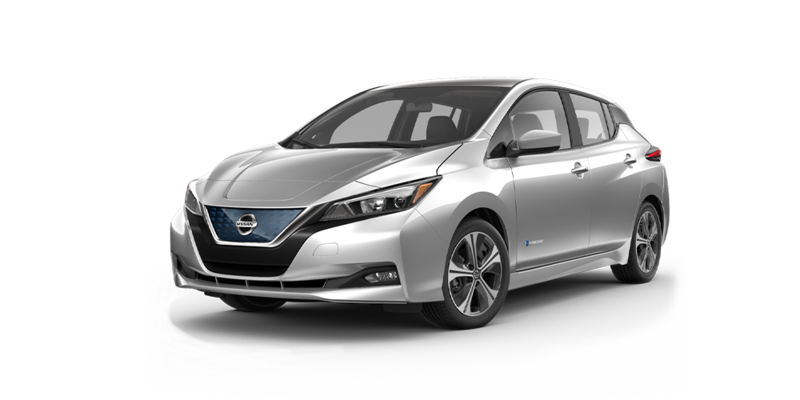 Available to well-qualified buyers through Nissan Motor Acceptance Corporation. See dealer for details. Illustration shown may not be the same as actual vehicle sold.